Girls will be girls regardless of the playground or communications toys they’re using. From a marketing perspective, it’s important to understand that women leverage social media, particularly Facebook, as an extension of what they do elsewhere. For marketing insights into how women use Facebook, let’s look at two different women with whom I have real life relationships. While these two women have divergent Facebook footprints, both have two children and neither lives in a major city. Another girlfriend confided that she felt disconnected when she was in New York because she couldn’t keep up with her friends on Facebook (despite her Droid smartphone.) You’d think she’d have a large Facebook following yet she’s only got about half the average number of Facebook friends. Women appreciate Facebook for providing another way to stay connected with their friends based on Eversave’s survey of 400 women. Facebook helps them to effectively keep their friends informed about their lives (79%) and share interesting and/or funny links and videos (64%). Further, Facebook allows women to expand their experience of keeping in touch by seeing friends’ photos and videos (91%) and searching for long lost friends (76%). About 84% of those women interviewed were annoyed at one time or another by one of their Facebook friends. As a woman, this doesn’t strike me as unusual since at some point, you’re going to get annoyed by a friend over something. Given that social media allows for asynchronous many-to-many communications, there’s a strong possibility that a message may be misconstrued or misinterpreted, especially if you factor into the equation the use of unusual abbreviations or shorthand by one or more of the participants. 63% of respondents were annoyed by women who complained all the time. That’s certainly not unique to Facebook. Who wants to hear someone complain incessantly online or offline? 41% of respondents were annoyed by women who posted political messages they weren’t interested in or didn’t agree with. While this also happens in real-life, it can be more difficult to deal with on Facebook. 32% of respondents were annoyed by women who bragged about their perfect life. It’s keeping-with-the-Jones played out on Facebook. Seeing it in on your Facebook news feed makes it feel more personal. Of course, this raises the question that if their life is so good, why do they need to advertise the fact? 14% of respondents always post about their precious kids. These women probably talk about their children incessantly in real life as well but the context is different and doesn’t get under your skin as badly. Also, if you don’t have kids, you may not see these friends as often. The difference with Facebook is that it provides a way to share your life with a broader circle of family and friends more frequently. Interestingly, many of the irritations women felt about their Facebook friends were similar to how consumers feel about companies they follow on Facebook. Women thought their Facebook friends shared too many mundane updates too frequently (65%), they “Like” too many posts (46%), and they inappropriately or too frequently use Facebook to promote causes (40%) – according to Eversave’s research. Consumers cited company posted too frequently (44%), my wall was getting too crowded with marketing messages (43%) and company content was too boring (38%) as reasons for unliking brands on Facebook according to Exact Target’s The Social Breakup research. 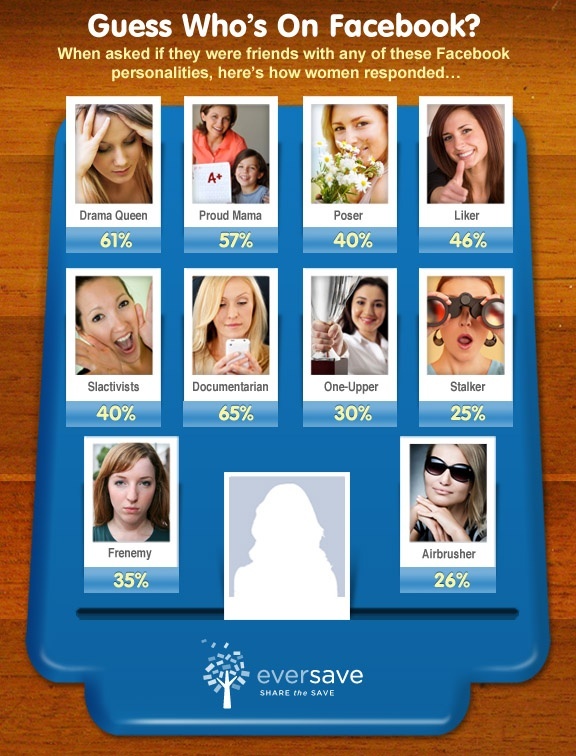 As a marketer, understand that women use Facebook to interact and keep up with their friends. For many, it’s an extension of their real-life relationships and they have real-life reactions to these exchanges. Since Facebook reflects these real-life interactions, marketers should tread carefully to avoid being seen as uninvited guests at a party. To this end, it’s critical to provide value to your Facebook friends and fans. How do you feel about these Facebook research findings? Based on this data, what would you recommend to marketers? Please share your perspective in the comment section below. Tip of my Hat to Margie Clayman since this post is part of her series on Women and Social Media. Tags Eversave, Exact Target, Facebook, Social Breakup, Women. Bookmark the permalink. It’s interesting because I recently blocked most of the posts from marketers on my personal Facebook page. I liked them with my fan page also and when I’m looking for deals or news, I will log in as my fan page – but I was finding that my stream was cluttered with ads/posts and I wasn’t seeing anything from real friends any more. Since most people have only their personal page, I would caution marketers to make sure that EVERY post is adding value and to post less often rather than more. I block the sites as they come up in my stream IF the post is not one I care to see more like that again. IF it’s a link to a coupon or a sale that I wouldn’t have otherwise known about, I often leave them alone so I’ll be twice as likely to see it – once on my personal on once on my fan page. Thank you Heidi for the great contribution to the Series! My only concern is that for those of us who *are* women marketers, does this underplay the power that we have online? If we say that women predominantly use Facebook to be social (those women sure can chat), does that undermine the efforts of women who may be using Facebook or Twitter to do business or to network professionally? Is this an easy way to dismiss the power women have online? In terms of your question about those of us who are BOTH women and marketers, this research focused on women and their use of Facebook for personal reasons by a company interested in special offers. Further the percentage of women who are also marketers and use Facebook for marketing is a very small subset of total women. Since you’re one of them, it may seem like a larger proportion since you know many of them.